Now awesome is this? They might be able to use DNA to identify two crewmen found in the Monitor‘s turret. Hat tip to Battlefields and Bibliophiles. …on opening night, planning to post my reaction to it here that weekend. Needless to say, it’s taken me quite a bit longer to write it up, but it’s one of those movies you need to mull over before you can decide how much you enjoyed it. I think it’s a film worth seeing, though I do have some qualifications. I suppose I should say that there are some plot spoilers below, on the off-chance that anyone reading this is unaware of how the story wraps up. This is not a movie about Mary Surratt so much as it’s a movie about Frederick Aiken, the young Union veteran appointed to defend her before a military commission which has seemingly decided her guilt before the trial even begins. The story arc is closer to a John Grisham thriller than anything else. A young lawyer gets slapped with a mysterious and difficult client, starts poking around, comes to think there’s more going on than meets the eye, allows trouble in the courtroom to spill over into his personal life, is gradually convinced that said client is getting a raw deal, develops a bond with said client, and wages a determined courtroom battle against impossible odds. Explicitly, the movie takes no stance on the issue of her involvement in the assassination. The title character, like her historical counterpart, maintains her innocence throughout the trial, admitting only that she was aware of her son’s involvement in Booth’s kidnapping plot. We never know with any certainty whether she’s telling the truth. Neither does her lawyer, who admits near the movie’s end that he doesn’t know whether or not his client is an assassin. She comes across as a sympathetic figure, more committed to preserving the life of her fugitive son than anything else. (It’s worth noting that Robin Wright’s performance in the title role is by far the movie’s strongest asset.) The whole story is up there on the screen, but it’s told in such a way as to generate quite a bit of reasonable doubt. Anyone who believes she was innocent will find little in the movie to offend them; anyone who believes otherwise will probably find watching it to be a frustrating though entertaining experience. The other key witness was Louis Weichmann, a resident of Mrs. Surratt’s D.C. boardinghouse and a close friend of her son. It was Weichmann who took her to Maryland on the two occasions in which she instructed Lloyd to have the carbines ready for pick-up, and who additionally testified that she and Booth conversed at the boardinghouse on the day of the assassination. He further claimed that Booth and his accomplices often met at the house, that Mary Surratt’s son was involved in these meetings, and that the family had links to the Confederate network that operated near the capital. Neither Lloyd nor Weichmann appear terribly credible in the movie, although in 1865 their testimony was convincing enough to send Mary Surratt to her death. One other damning bit of evidence concerns co-conspirator Lewis Powell, who attacked and nearly killed Secretary of State William Seward on the same night Booth shot Lincoln. In a remarkable case of bad timing, Powell arrived at the boardinghouse on the night of April 17 while troops were on hand to place Mrs. Surratt under arrest. She claimed that she didn’t know him, but Powell frequented the house; her denial therefore did nothing to help her case. Her lawyers tried to argue that she simply didn’t recognize him, presenting witnesses who claimed that her vision was poor. The movie depicts this in flashback: Powell arrives at the boardinghouse and when the soldiers ask Surratt whether she knows him, she squints as if she’s taking an eye exam. Is she faking it? For that matter, is this a depiction of the defense’s interpretation rather than a flashback? We’re never sure, and the fact that her innocence or culpability is never definitively established makes it difficult to emotionally invest in her plight. And yet that’s what we’re evidently supposed to do, because the film’s real villains are the government officials attempting to railroad her: an unscrupulous Judge Advocate General Joseph Holt, a coldly ruthless Edwin Stanton, and a military commission officiating over what appears to be a rubber-stamp trial. We see the commissioners obstructing the defense at every turn, Holt goading witnesses on the stand, and Stanton manipulating the deliberations to get the result he wants. The events on the screen roll along to their conclusion with a kind of mechanical inevitability, so the movie doesn’t have the kind of tension that characterizes classic courtroom dramas. Of course, it’s harder to establish suspense when most audience members are already aware of the outcome, but that’s part of the challenge of using history as the basis for drama. The Conspirator doesn’t meet this challenge as well as a film like Valkyrie, which whipped up plenty of nail-biting tension despite its pre-determined conclusion. The question of whether or not the government was justified in trying her and the other accused conspirators by military commission makes great fodder for historical debate, but at the time there was widespread support for utilizing military law to try the accused assassins. Attorney General James Speed, for one, argued that a military trial was appropriate, given the nature and setting of the crime. 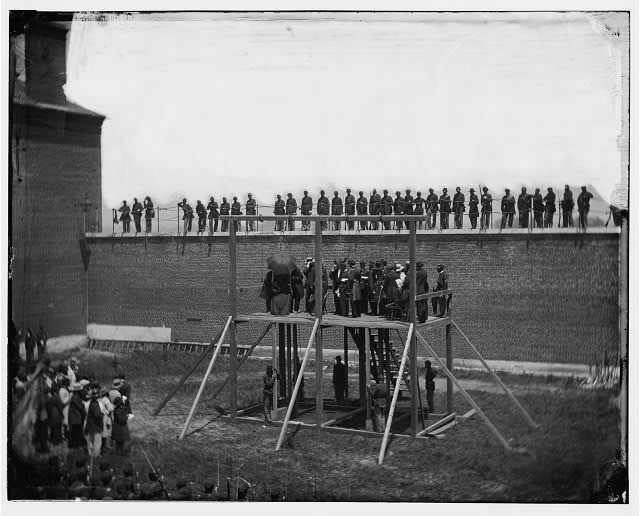 In 1866 the Supreme Court ruled that civilians could not be tried by military court when no threat of war existed and as long as regular courts were available, but of course this was the year after Mary Surratt and three other conspirators went to the gallows. Perhaps it would have been moot anyway; in his fine study of the assassination, Ed Steers notes that although the use of a military commission put the accused at a disadvantage (conviction did not require a unanimous jury vote and the President of the U.S. was the only source of appeal), the actual courtroom procedures were similar to what would have been used in a civil court. What I’ve read of the conspiracy has me pretty well convinced that Mary Surratt knew what Booth and his accomplices were up to in April 1865, and that she not only consented to the plot but helped move it along. Perhaps if I were more skeptical of her involvement, I’d be less reserved in my praise for the movie. Still, I enjoyed it; its depictions of Lincoln’s murder and the attack on Seward are quite good, and the hanging sequence is especially powerful. This is a worthwhile inaugural effort in the American Film Company’s goal of producing good historical films. I think we should encourage them. See it for yourself and decide what you think. This May, curator Brett Kelly of the National Civil War Museum in Harrisburg, PA is going to make all other public historians across the nation look like sissies. He’ll conduct a two-week march in period outfit from Virginia to Pennsylvania as part of a fundraising drive. Full pack, no tent, nineteenth-century rations. Click here for information on how to donate. Back in my museum days, I thought I deserved a medal just for working every fifth weekend. Now that I’ve read this, I feel like a wuss. The museum will also conduct an “alternate reality” game to run concurrently with the march. My thanks to educator Jeff Mummert for bringing this to my attention; check out his blog for details on the game. I was both surprised and saddened to learn that Kevin Jarre, a talented screenwriter and dedicated history buff, has died. His screenplays included two notable historical projects, Glory and Tombstone. In my opinion, Glory is not only the finest Civil War movie ever made but also one of the ten best movies of any sort ever made. (Jarre himself had a cameo as a Union soldier.) The first time I saw it was in a classroom when I was in the eighth grade. This was long before I’d developed a serious interest in the past, but even then it made quite an impression. A few years later, for a high school history project, we all had to give a presentation on any American historical figure, so I picked Robert Gould Shaw. Jarre had been a self-described “Civil War freak” since childhood, when he received toy soldiers from the era for Christmas. His interest in the 54th Massachusetts, a regiment that was one of first black units during the Civil War, was piqued when a friend, Lincoln Kirstein, observed that a photograph of Jarre on horseback resembled a statue of Col. Robert Gould Shaw, the regiment’s white leader. My family met a friend of Jarre’s at a western history conference in Arizona back in the nineties. He told us Jarre was writing a screenplay about the Lincoln assassination. I don’t know if he finished it, but a tale like that in the hands of a master storyteller like Jarre would’ve been a movie worth seeing. The man had an intuitive sense of the past’s dramatic possibilities and a gift for bringing it to life in a way that was both authentic and immediate. Hollywood could use more like him. Just how bad is the state of popular Civil War writing? We need sociologists to study these people. Instead we get Civil War authors who serve their segment of this market with elaborately contrived master narratives, books gushing with “novelistic” anecdotes ripped out of their natural context (of diaries and letters), and stripped down “stories” featuring “characters” who amuse and entertain. The crackhouse that is Civil War history has its corner in the larger slum of nonfiction publishing, with suburbanites cruising through to score their stuff on the way to the beach. Party on dudes. I always enjoy reading Rotov’s thoughts on historiography, even though I have a great deal of respect for some of the authors he often singles out for criticism. Regardless of questions over which specific books are bad and which aren’t, he’s got a point here. There is undeniably a lot of shallow, superficial tripe getting cranked out in the name of popularized Civil War history. Next time you have a minute, browse through some reader reviews of popular historical books at Amazon.com and note how many customers gush over works that made them feel like they were reading a novel, or caught them up in the story, or made them forget that they were reading a history book, and so on. If you can’t enjoy a history book unless you forget that it is, in fact, a history book, then why exactly did you buy it and start reading it in the first place? Apparently we’ve become so addicted to diversion that we have to treat ourselves like kids, absorbing little nuggets of information surreptitiously in the same way that a toddler will eat vitamins only when Mom slips them into some chocolate pudding. In this case, though, it’s ourselves we’re trying to fool: “It was so entertaining, I forgot I was reading a history book!” When thou readest history, let not thy left brain know what thy right brain doeth. Indeed, when we compare the number of shallow and commercially driven Civil War books to the number of genuinely original studies, the results might look a little dismaying. The widespread interest in the war means that lots of commercially driven junk gets published because there are people who are willing to buy it. You don’t get this level of commercial interest when it comes to, say, the Progressive Era or seventeenth-century English colonies, where more analytic or academic books are the norm, simply because there isn’t as much of a market for popular books in those fields. Still, I think it’s easy to overstate the problem. Leave aside for a moment the ratio of mediocre Civil War books to very good Civil War books. Instead, compare the number of solid Civil War books getting published to the number of solid books being published in other historical fields of study, and I think the former discipline comes out looking pretty robust. In fact, as someone whose special interests lie mainly in earlier periods of history, I don’t think Civil War readers know how comparatively well off they are. I’ve lamented before how surprising the lacunae in early American historiography can be; we have major historical actors without modern biographies, fundamental questions unanswered, and critical events unexamined. You may not be entirely pleased with the available literature on a given Civil War topic, but chances are there is at least a literature in place, so that the student or scholar has some sort of foundation on which to build. In any case, if you dislike commercialized historical writing, the best remedy is to avoid buying it. Publishers will keep cranking out infotainment as long as there’s a market for it. Allow me to direct your attention to a brand-new Lincoln blog where I’ll be posting regularly from now on in addition to my usual shenanigans here. Lincoln Memorial University recently launched a new venture called the Abraham Lincoln Institute for the Study of Leadership and Public Policy. Its goal is to provide a forum for Lincoln scholars to present their work, connect them with people who are interested in applying historical insights to present-day problems, and present the results of these efforts to the public. The Institute has already inaugurated a lecture series and is collaborating with other institutions on a variety of projects to increase understanding of Lincoln and his legacy. Dr. Charles Hubbard, who is the Institute’s first executive director, is also a former boss and professor of mine who’s developed an interest in online media as a venue for public history. He’s allowed me to collaborate with him in setting up and maintaining a blog for the Institute, which you can access at the following address: http://lincolninstitute.wordpress.com/. I’ll be blogging there on a regular basis, and we’ll also have guest posts from Lincoln scholars popping up from time to time. We’ll be exploring developments in Lincoln historiography and public history, providing updates on Lincoln-related happenings at LMU, posting interviews with historians who specialize in Lincoln and the Civil War, and highlighting material from the collections of LMU’s Abraham Lincoln Library and Museum. If you read history blogs, I hope you’ll either subscribe to the new site via e-mail or make it one of your regular online stops. And if you’re a history blogger, I hope you’ll add it to your blogroll and let your readers know about it. I’ll still be blogging here at Past in the Present as usual, too. Since the other site is an institutional blog, though, I’ll be trying to act a little more professional over there. (No Dark Knight clips, in other words.) And it should probably go without saying that whatever views I express over here at my personal blog are mine alone, and not those of LMU, the Institute, Dr. Hubbard, or anyone else, but I’ll say it anyway. …of Knoxville, with Jack Neely as your virtual guide. His “Secret History” column in the Metro Pulse is always an intriguing read. Any city that hosted both Union and Confederate rallies on the same street and at the same time is bound to have some notable stories to tell. If you’ve got an appetite for more, there are a couple of books worth recommending. Robert Tracy McKenzie’s Lincolnites and Rebels explores the political struggles in Knoxville during the Civil War era. Digby Seymour’s Divided Loyalties provides a detailed account of the fighting in and around town, particularly the dramatic Confederate assault on Fort Sanders in 1863.